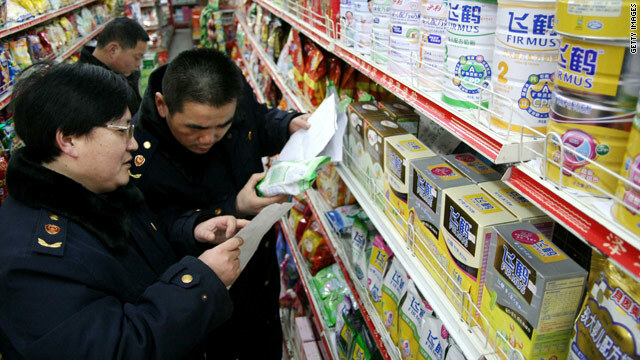 Health enforcement officers check labels on milk powders at a store in east China's Anhui province. Beijing, China (CNN) -- Chinese authorities have seized 72 tons of milk powder tainted with melamine and are trying to track down an additional 100 tons, less than two years after contaminated milk killed babies and sickened people across China. The seized milk powder is from a batch that was recalled in September 2008 after it killed six babies and sickened 300,000 people, state-media reported Monday. The powder had been ordered destroyed, but a dairy firm in the Ningxia Hua autonomous region received the batch as debt payment from another company, said the China Daily newspaper. The company then sold the milk to five other factories in Fujian and Guangdong provinces and in the Inner Mongolia autonomous region. On Saturday, authorities shut down the company. The tainted milk, which was mostly baby formula, first came to light in September 2008, after children fell ill. State media has not said whether any sickness or deaths have been linked to the remaining powder.